This exquisite piece of collectible artwork carries with it an inspiring but grievous history. Although becoming President of South Africa, (for only five years), the balance of Nelson Mandela’s life was filled with hardship and tragedy. Living under apartheid, Mandela survived underground and in the shadows of an illicit system until 46 when he was sentenced to life imprisonment. His only two sons died early on from an auto accident and AIDS. His great granddaughter, Zenani, was tragically killed on the eve of the 2010 World Cup held in South Africa. In mourning, Mandela canceled an expected appearance the next day before a global audience of billions. Neither of Mandela’s marriages fared well. Bickering between the two families exist to this day. Mandela willed everything to his Foundations with little left to his heirs. In addition to Cecil the Lion being killed by an American trophy hunter, the rest of Africa also suffers. At the exact moment Mandela was elected President, the genocide of 1 million in Rwanda was taking place. Shortly thereafter, “Africa’s World War” started when millions of civilians in Central Africa were killed, abused and raped; atrocities continue to this day. The Civil Rights struggle in America mirrors that of South Africa. Injustice, as in “TO KILL A MOCKINGBIRD”, is reflected in the life cut short by one of Norris Barker’s students in South Africa, Immanuel Nlapo, who died a true freedom fighter. He is eulogized in a personal conversation Barker had with Mandela shortly after his release from prison (Barker had been led to Nelson Mandela by Divine Intervention that same night on Oct. 7, 1990 after attending Nlapo’s funeral in Soweto). 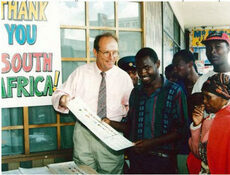 As a result of Nlapo’s ultimate sacrifice, Barker followed Mandela’s march to the Presidency prodigiously, thus, leading to his winning bid for ballots from the South African Government. Norris Barker saved the Treasury of the South Africa Government $ millions of dollars from corruption; plus, he helped preserve the ballots for future ownership as mementos of a historic time. In 1994, with the help of the South African press (in transition at the time), an inside deal to sell purposely misplaced and hijacked ballots was stymied. Three (3) prosecutions of government underlings took place but no higher ups were ever charged. In the meantime, the current ANC controlled government has also been accused of massive corruption and abuse of power. The Mandela name and likeness is now so valuable to those with Mandela links (ANC, government, Foundations) that the IEC (Independent Electoral Commission) filed a cease and desist order (later rescinded) to prevent Barker and his company, Afridom.com, from marketing and doing good (V-Day Foundation for Obstetric Fistula in Democratic Republic of Congo) with the ballots. Compared to other leaders, Nelson Mandela is indeed an anomaly on planet earth.